The first few days after death are among the most busy for the executor of the estate, but one could be forgiven for thinking things will settle down shortly after that. After all, you read on websites and people say to you things like “It’s a marathon, not a sprint,” assuring you to take your time and not stress out. Unfortunately, it stays busy for months. If the estate is not large enough to warrant hiring an attorney, the executor can be quite busy, and there are court-imposed deadlines for getting various things done, independent of the natural desire to wrap things up and get the money to the heirs and beneficiaries. If the estate’s assets are not complex, and if there are few heirs, then truly it doesn’t have to be very complex. My father’s estate was not large and not complex, consisting almost entirely of a simple bank account, but there were a large number of people named in his will. Some of those people were children, and some of them were non-US citizens, living overseas. One of them was a child living overseas. As soon as there is more than a single beneficiary, the estate has gained complexity. When one or more beneficiaries are minors, that complexity expands considerably. When international beneficiaries are added to the mix… well, you get the idea. As executor, you are legally bound to pay attention to every detail, and whether or not the process sails easily through court or gets bound up in all kinds of oversight depends upon getting those details right. Well-meaning relatives will tell you “oh, don’t worry about x, y, or z”, because it’s just a family affair and everyone will understand, but that actually doesn’t wash. It’s a legal affair, and it’s also an IRS affair, and courts and the IRS are not known for being forgiving of fudging the details. Additionally, when there are many beneficiaries, and some of them are relatives who have grown distant from the family, whom you no longer know very well and don’t know how they will respond, there is added impetus to dot all the I’s and cross all the T’s. The executor can be legally liable for any mistakes. You have to protect yourself. So, all that sounds rather scary, but actually it’s not that bad. The key is attention to detail and being organized. Some advance preparation can help as well. I am not a highly organized person by nature, but I am detail-oriented, sometimes to a fault (this is useful in my job, but sometimes causes personal projects to take far longer than needed). Knowing that it would be a difficult and unfamiliar process, I took steps before my father died to map out what the process would look like, to create an outline of what had to be done and when. I created a death checklist. Death of a loved one, even when expected in an elderly parent, is generally an emotionally difficult time. I anticipated this, and I thought having a checklist that I could follow, ticking off the tasks as I completed them, would help keep me on track. That turned out to be true, although not everything happened the way I expected it to. What I did not anticipate was how clinical I could become about the whole process, relegating it in my mind to this checklist, this series of steps to take, documents to file with the court and mail to the beneficiaries, arrangements to make with the bank and other institutions, forms to send to IRS. It was necessary to stay focused, but at times I actually feel guilty for not being more emotional about the fact that my father is gone. It hits me every once in a while, but overall I feel rather detached, and I wonder if there’s something not quite right about me because of that. My siblings have thanked me again and again for handling this and praised the job I’ve done, and inside I still at times feel a bit like a fraud, because after all, I’m just following this checklist. At times I’ve had to harangue some of the beneficiaries (or their guardians, in the case of the minors) when I’ve needed something from them, and this especially makes me feel awful. I send off a hopefully-diplomatically worded email, or Facebook IM, or actual letter in one case, and afterwards I remember that this person just lost their father, or grandfather, or great-grandfather, and I’m harassing them about some document or other. I had to send another such missive off last night, and here it was, the eve of Thanksgiving. What a holiday spirit. So there you have the first set of rocks that, as executor, you must carefully navigate around. You need a careful balance of humanity and detachment. The detachment is necessary if the job is to be done, and done right, and in a timely manner. Really, everyone else will thank you for this in the end. So what really is the job of the executor? What is all this work that I’ve alluded to above? Well, in my case, the job started about two years before my father actually died, and perhaps that’s why I was so detached from it all when the time finally arrived. I had been anticipating and preparing for it for a long time. It all started when my older brother suffered a worksite injury that put him in the hospital for about six weeks, and for which the outcome was rather uncertain. He eventually recovered pretty much fully from that, thankfully, but at the time it was rather frightening. As the eldest of all the siblings, he had somewhat naturally assumed the job of taking care of our elderly father’s affairs, especially in the first year after Dad moved into assisted living. Suddenly he was out of commission, and it fell to me to pick up the reins. I think at that point I realized that I had always been rather selfish, letting my brother take care of all the family business while I just got on with my life, and I resolved to step up and do my part. FYI, I blogged about my brother’s hospital experience at http://www.caringbridge.org (login required), and that was my first-ever blog. After spending the best part of a week at my brother’s bedside in the ICU, I resolved to pick up where he had left off in the care of our father. The biggest part of that was regularly visiting him at his assisted living center. I had visited him, of course, but as it was nearly a ninety-minute drive (in traffic) from my home, it wasn’t all that frequent. Now it became a weekly affair, and soon I was making the drive from downtown Seattle to Gig Harbor every Monday after work. We spent this time chatting, watching movies on his TV, eating dinner at the facility’s cafeteria, and talking about his fascinating life story (a few hints of which have already appeared in these pages). Tax season was approaching, and I knew that my father would need help with his taxes. So, we executed a Financial Power of Attorney and I began sorting out his finances. I found a mess. Rob, my brother, had done much to see to Dad’s medical affairs and general day-to-day wellbeing, but he had left his financial affairs alone, and we had both trusted that Dad knew enough to take care of things for himself. It turned out that his mental state had been deteriorating for some time before he went into assisted living, and we just had not realized it. Organizing his finances for purposes of tax preparation gave me a very good picture of his overall financial picture, of course, and keeping things on track for the next couple of years, up until his death, meant that when the time came there were no hidden surprises in store for me. So, this was the first part of being prepared. Once I had the Financial Power of Attorney in place and had settled his bank accounts and tax status, I moved on to getting the rest of his estate in order. I asked to see his will. He had one, hand-written, un-notarized, a single paragraph stating, in effect, that he gave everything to Rob and trusted him to distribute it fairly. In his papers I found another one, typed but un-signed and un-dated, in which he said something about giving money to each of his grandchildren, so that they might remember him. It was not clear which was the most recent, and of course they were in conflict. Neither was likely to stand up to any challenge, should someone object. So, I discussed this with both Rob (by this time he had mostly recovered from his accident, but we agreed that since I had delved so deeply into Dad’s finances, I should continue in the role, while Rob would handle the Medical Power of Attorney duties — a division of duties that suited me perfectly, as if the need for a ‘pull the plug’ decision were ever to come, I really really didn’t want to have to lead that) and Dad. The three of us agreed that a new will was required, and after a lot of spreadsheeting of various scenarios, we agreed on a plan. One of the elements of this plan was an attempt to bring some of Dad’s great-grandchildren, who had been inadvertently cut off from the family by the actions of their father, back into contact. In essence, Dad named great-grandchildren in his will both so that they would have something to remember him by, but also so that there could be an ‘inciting incident’ (to use literary terminology) to bring us all back together. This was a brilliant idea, and one that ultimately worked extremely well. It also added considerable complexity to the estate management, a fact I would not realize until after Dad’s death when I delved into the particulars of making it all happen. I have no regrets on that score, however, and the complexity has been worth every day of work missed, every court appearance, the attorney’s fees that ultimately had to be paid anyway, and all the extra filings and snarky emails I had to send. By this simple decision to extend his will to one further generation, Dad re-united our family in a way that had stymied us previously. Again, money was an issue, so hiring an attorney to draft the will was not a reasonable alternative. Fortunately, without real estate or business assets involved, nor an expectation of anything highly contentious, an attorney was not required. We selected Nolo’s WillMaker software to draft the will and found a notary public who would travel to Dad’s location in Gig Harbor. Easy peasy. And of course, who would be selected as executor? I volunteered, of course, but it only made sense. I had been Dad’s financial advisor and power of attorney for some time. I pretty much managed his bank accounts for him, giving him monthly reports on his status. I talked with him regularly about his wishes. I prepared his tax returns and represented him to IRS. I helped him draft the will. I lived not too far away. I worried, of course, that some might see a conflict of interest, since I was also named as a beneficiary in the will. I am his son, after all. So, I took great pains to be as open and forthcoming as I could with everyone about every aspect of the estate, without compromising Dad’s privacy too much. Later, after Dad suffered his stroke, it was clear we needed to update the will, as by then a new great-grandchild had been born and another was on the way. We planned to wait until Eleanor would be born and then revise to include the new family additions. But, last February, on the advice of Dad’s doctor, he entered hospice care, and we all agreed that we could not wait for Eleanor’s birth. I could not find anything to indicate a problem with naming an unborn beneficiary, and of course we hoped that she would be born by the time the will had to be put into action. About two months after Dad’s death, Eleanor was born, a beautiful baby girl. She never did get to meet her great-grandfather, but because of him she now has a small financial stake for her start in life. It’s not much, but from tiny beginnings, great things may come. Captain Fraser has sailed into his sunset. Early on the morning of Sunday, 3 March 2013, my father breathed his last and departed to rejoin his wife, who left us sometime earlier, in 2002. My brother and I spent the night at his side, holding his vigil and keeping him company, while he ranged ahead to scout his path, until he no longer had need of us. He was 92 years old. The past year has been a busy one for me, and I fear both writing and research had to take a back seat for a time as my father had more immediate needs for my attention. Last August he suffered a stroke, which necessitated a month in hospital and rehab and then a move to a more advanced long-term care home. Our days of watching Game of Thrones together and discussing his nautical adventures came to an end. Instead our attention had to shift to ensuring he was getting the medical care he required and, sadly, seeing that his affairs were all in order. I still visited him about weekly, but due to the communal nature of his new living arrangement, it was not reasonable to spend hours with him the way I had in his previous assisted living center. In February his doctor advised him to shift to hospice care, and this was a good call. I think all the exams and tests and needle pricks were probably getting to be a bit much, and now there was no longer any need for all that, replacing it instead with a focus on comfort and quality of life. Indeed, the changed nature of the attention paid upon my father rather brightened his outlook, and his health rebounded somewhat, but the doctor’s prognosis was not in error. His kidneys were failing, he had persistent low-grade pneumonia, and things were just shutting down. That Saturday evening the staff at his home called me to say he was in rapid decline, and when I fussed about calling my brother my wife said to me, “I’ll take care of that; you go. You don’t want to be late.” The home was only a block from my own, and so I grabbed phone, wallet, and keys and ran over there. When I arrived he was in his bed, unconscious, breathing with difficulty, and a nurse from the hospice was attending to him. My brother arrived not long after that. The youngest of the caregivers from the home, the one who had found my father slumped, unresponsive, in his chair, looked on, clearly fighting hard to hold back tears. In a halting voice she told us she tried hard not to become too attached to the residents, for obvious reasons, but then the tears came on strong and she admitted, “But I fell in love with your dad.” He always did have that effect on the ladies. Hers were not the only wet eyes. As the evening wore on most visitors left, the nurse having given the staff instructions to administer a medication regularly. We called our sisters to let them know, and the two in California elected to catch the next flight, departing at 7am. The staff woman staying on duty that night slept on the couch, getting up every two hours, like clockwork, to come down and give him his dose. My brother, Rob, and I stayed on, awake, through the night, dozing but a little in the darkest pre-dawn hours, speaking to my father, reading him poems, and holding his hand. Shortly before 7 we stepped upstairs for a cup of tea. We were upstairs for perhaps ten minutes. When we came back down, he was gone. It was just after 7, and Jocelyn and Deborah’s flight had just taken off from San Francisco. I looked out the window at the sunrise and saw that the forecasters had got it wrong yet again: it was supposed to be cloudy and drizzly on Sunday, but in fact the day dawned clear, bright, and beautiful, if rather chilly. I am not an overly emotional person, but I struggled with it then. It is not at all uncommon for dying people to wait for others to leave the room, and I knew this, even thought of it while drinking that cup of tea, and yet now I could not shake a sense of guilt for having stepped out of the room. Later something my niece would say to me would cause me to realize that, after the years of rather intense invasions of privacy, both physical and financial, associated with assisted living, this would be the one final act that my father could take in complete privacy, on his own terms, and this was a comforting thought. He remained the Master of his fate, the Captain of his soul. A few hours later the girls arrived, with only one slight detour due to Seattle’s infamous street signage (no, you cannot drive a car down a stairway, though city maps might lead you to believe it is a through route). We had elected not to tell them until they arrived, knowing they were driving a rental car in an unfamiliar city while sleep-deprived, but Deborah took one look at my face and knew. The hospice sent out another nurse to help us prepare Dad for his last journey. He was a big fellow, no two ways about it, and while the nurse was entirely competent and professional, she was also a younger lady of slighter stature. She did not ask for it, but it was clear she was going to need some help. Rob and I looked at each other, went into the room with her, and shut the door. She was very thankful. I will not describe the process of washing and dressing my father’s body, but I will say that it was at once difficult for me and also helpful. I cannot say it was at all pleasant, by any means, but it felt ritualistic, and by the time we were done it had helped me come to terms with everything. The nurse helped tremendously with her cool professionalism and calm, respectful manner. My final image of Dad is one of patrician dignity lying in calm, peaceful repose. The funeral home’s man arrived, and we helped shift Dad’s body into his black van. The fellow apologized that he had another “passenger” that day, so he hoped we would not mind if Dad had to share the ride. We believe Dad’s only objection would be that his companion was a gentleman rather than a lady. I watched as the van drove off and out of sight, then turned and went back inside to rejoin the others. The next 36 hours are a bit of a blur to me. Sunday afternoon was all about family, and Monday was yet another beautiful day, with the Olympics, Cascades, and Mt Rainier shining in crystal snow-capped clarity. We took a walk along Magnolia Bluff and watched a tug towing a barge into Elliott Bay. It was not a Foss tug, unfortunately. That evening the girls caught their flight back to California, and Tuesday my work dealing with “officialdom” began. Appropriately, Tuesday was more typically Seattle grey. Captain Robert William Campbell Fraser, Lieutenant Commander, RNZNR, Marine Superintendent, and Master Mariner, veteran of World War II, of Foss Launch & Tug, Dillingham Corporation, the Union Steamship Company, and J&C Harrison’s Shipping, husband of Dorothy and Judith, son of John Fraser and Gladys Annie Dinah Statter, father, grandfather, great-grandfather, brother, uncle, and friend, has departed on his final command, a last cruise, at the far end of which his beloved wife awaits him. So he had always believed, and so it is true. May we all live a life so well. Apologies, dear readers, for the delay between posts, but like many of you in late December, I’ve been on holiday. Carole and I were in France for two weeks, and while I did explore a little bit down a side avenue of research, the main purpose of the trip was family. Living family, that is. Carole is French in origin, and we were there to spend the holidays with her family. We flew in via non-stop from Seattle to Paris, and direct from the airport caught the TGV to Montpellier, and from there a regional train to Carcassonne. The TGV is France’s high-speed passenger rail system, and the trains can get up to 200 mph, which would be pretty exciting except they’re so dang smooth on the rails that there’s not much sensation of speed until suddenly you pass one going the other way. The other train is suddenly and momentarily there, creating a split-second of a ‘whoomph’ sound, and then it’s gone, nothing but the briefest of blurs. Certainly there’s no time to notice any details about it at all. The first thought is well, that must have been a short train, and then it occurs to you that you’re on a pretty long train, and that other train was probably similar in its length, and it dawns on you just how fast you really are moving over the ground. Being the geeky sort, I did attempt to clock the speed with a GPS, but besides being an efficient way of moving about the country, the train is also an efficient blocker of GPS signals. I never was able to get a lock. The other thing to note about the TGV, and the SNCF railways in general, is how to make proper use of the bar car. In the bar car there is a large and extensive menu of food, and behind the bar are various cabinets and ovens and such. From this one might deduce that a meal can be obtained, but the veteran traveler of the railways knows that looks can be deceiving. The thought of a hot sandwich, such as a Croque Monsieur (a favorite of mine, actually), was quite appealing when I saw it advertised, but when I asked for it in my halting and very bad French, the gentleman behind the bar was able to convey to me that his oven was out of order and so there was no hot food available. It’s true that he did use language to tell me this, but the message really got through when he pointed to the sign on the oven that said… well, it said something in French, but it was red and it looked a lot like an “out of order” sign to me, so I got the point. Not to be deterred, I selected a pair of cold sandwiches. The barman went through his cabinets and… the date stamp on the sandwiches was expired. He looked for others: expired. He went through every cabinet. In the end, he had exactly one type of small, uninteresting sandwich which was still safely edible, according to the label, and cabinets full of expired food, next to the inoperable oven. Carole tells me that French people don’t really expect to buy food on the train, they usually bring their own, and so would we have done except we had just come from the airport, so I gather the barman was probably caught by surprise by a customer actually… gasp… ordering from the menu. The coffee was good, however. At Lyon there was an announcement over the intercom, something about “action industrielle”, and Carole informed me that beyond Lyon the bar car was operated by a different union (I think), and this union was on strike, so from this point the bar car was closed. Either that, or the strike was just starting at the time we were in Lyon. I was still very jet-lagged and tired, so my French was practically non-existent. It did improve on later days, especially after copious consumption of coffee. Once arrived in Carcassonne we were met at the station by Carole’s brother, Lionel, who drove us the remaining 8 miles to his mother (and Carole’s stepmother) Eugenie’s house in Montirat. Montirat is probably not well known to most tourists, despite being just a handful of miles from what is arguably the third-most-visited tourist destination in the country. It is a small village, with a population of about 70, situated at the end of a narrow, winding country road that is not much more than a spur from an only slightly larger regional highway. It does boast a gite, or holiday rental home, but these are more likely to be occupied by French nationals on holiday than by foreign tourists (though I can highly recommend gites de France from personal experience on other occasions). There’s a small church. There’s no school. The nearest bakery isn’t even in town, it’s out on the D3 highway. What Montirat does have, however, is peace, quiet, and old-world charm. It sits atop a hill, giving it a little bit of a view of the surrounding vineyards, and its main road curls around the hill in a way that would delight Tolkien enthusiasts (think Hobbiton). At the apex of the hill, across the road from Eugenie’s house, are the crumbling remains of some old stone structure, redolent with hints of an unknown medieval history, now mostly buried in the grass and earth as farmers have gone about their business around it over the centuries. The old ruin is all that remains of a probably 13th century watchtower, once part of an early warning system for the locals, who in the event of attack could have time to take refuge behind the walls of the nearby fortified city of Carcassonne. We, meanwhile, took refuge from the winter rain and wind by spending our first days indoors, basically being lazy while recovering from jet lag and visiting with Lionel and Eugenie. 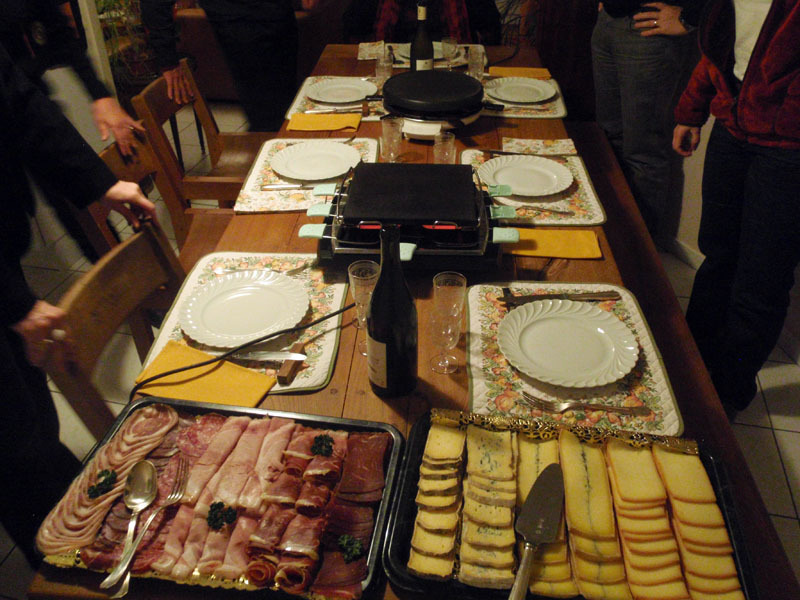 We ate well (it is France, after all), perhaps too well, a trend that was to continue throughout our stay and for which perhaps our stomachs were not entirely prepared. After a few days of easing into the French country life and decompressing from the stresses of work and air travel, it was time to move on. Once again on the train, Carcassonne to Grenoble, with a change in Lyon, and soon we found ourselves at Carole’s mother Anne-Marie’s in-town condo, a somewhat different experience from the cozy country house in Montirat with its chicken coop and its big yard. By now we were resurfacing into wakefulness, and we actually got out and walked about the city a little. 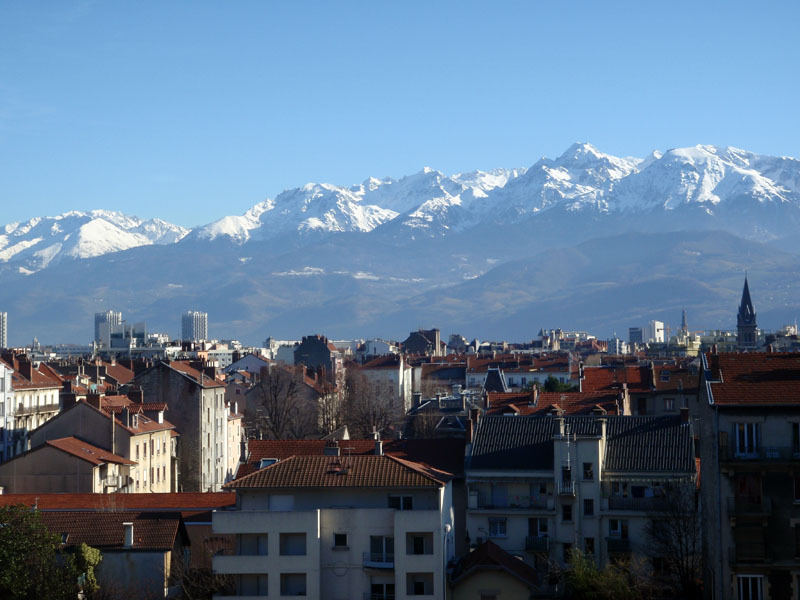 The weather even cooperated for this, clearing to magnificent crystalline blue skies for a day or two, enough to reveal the snow-covered Alps in their gleaming splendor looming directly over the city. Even some of my French now began to return to me, although only if people were patient enough to speak very slowly, articulate very deliberately, and use only the simplest of words and grammar could I understand them. However, I was able to get the gist of the conversations going on around me, and even put in a word now and then, stunning listeners with… well, not my erudition, but more likely my inability to speak even as well as a four-year-old. Perhaps the simple sound of their beautiful language being mangled in my mouth shocked them senseless. At least I didn’t ask for agua con gaz like I did during my first visit to France, twelve years ago. A few very pleasant days, some more excellent meals, and it was time to take the TGV back to Paris, this time alighting at the Gare de Lyon in the heart of town, being met by our friend Isabelle, who with her daughter Lucie kindly hosted us for the remainder of our stay. Isabelle and Lucie both speak English, and so now my hard-won language skills could fall back into disuse and disrepair. Isabelle even took us to see a show, How to Become Parisian in One Hour, which was given almost entirely in English. On another day we met another friend, Natalie, and wandered the streets, and it was while on the Champs Elysees and again near the Eiffel Tower that we encountered armed soldiers, in pairs, patrolling. We had seen them in the airport, which wasn’t so surprising, and in the train station, which still made some sense, but when I saw men in camouflage carrying machine guns on the streets of downtown I really started to wonder if something was up. I’m not sure if it’s a reaction to recent events, or simply stepped up alertness at key points during the holidays, when thousands of people are out and about, but mostly I thought about how those solders didn’t look a day over 18, and just how comfortable was I with a teenager with his finger poised over the trigger guard of a FAMAS or SIG 550 (I’m pretty sure I saw both models in use). Now, just to justify this pure travel story on a genealogy blog, I did do a little research while in France. Since we were, after all, visiting Carole’s family, I decided to research her ancestry a little. As it turns out, Lionel has an entire book about their father’s ancestry, and Anne-Marie had several pages about her family, and very quickly we traced ancestors back to the 16th century in Italy, Germany, Switzerland, and of course France, with a number of connections reaching into Africa. There are hints at some very interesting family stories, just waiting to be uncovered, but that will have to be another time, I think. Because, after all, I returned home to Seattle to find a package waiting for me: seventy-five pages, on CD, of my father’s personnel file from the Union Steam Ship Company, courtesy of the Wellington City Archives. I’ve been doing some thinking about how best to publish a pedigree chart that would show the relationships between the various people I’ve mentioned to date and myself, and I admit this is where my newbie status as a blogger shows itself. Indeed, this might be where it would be better to use a regular website and not a service like WordPress, which for all its power doesn’t seem to be very friendly to uploading formatted text, unless one is something of an expert with cascading style sheets and so forth. I’m not, and nor do I really have a desire to be; I’m here to research and write, not spend all my time figuring out how to publish pretty pictures. So, for those wanting to see a fancy chart, I’ll get there, but meanwhile I’ll have to resort to the old-fashioned descriptive text. Of course, other genealogists (and genealogy bloggers) whose work I’ve followed seem to be of two minds about whether to even publish such charts in the first place. For one thing, it seems there’s a trend toward “genealogy theft”, i.e. people simply lift the result of all your hard work and graft it onto their own family trees, for whatever reason I can’t quite fathom. Why anyone not related to me would want to put my ancestors in their family tree is beyond me, but apparently it happens. I suppose if I manage to somehow, some day, uncover the missing link between myself and some famous historical personage, it could be tempting for someone else with a family name appearing in my tree to “attach” themselves to that famous person. It might look very impressive to their friends, but it wouldn’t be true. Ah well, at this point I’ve not uncovered any such famous ancestors (well, maybe locally famous, but not such that they’d have a Wikipedia page or something). Belay that last. As I wrote that, I thought to myself, hmm, well, there is a line of ancestors on my father’s mother’s mother’s side that had a fair bit of money in the 19th century, a landed estate in England, and even a (rare) book* about them. Perhaps I should check. Wouldn’t you know it, my great-great-grandfather’s younger brother has his own Wikipedia entry after all. It seems that 3x-great-uncle William Hamilton Yatman (1819-1913) was moderately famous for his feats as a rower while at Cambridge. That, and a property he once owned is today a second home for Prince Charles. Ok, maybe someone might want to lay claim to some of this line after all. On the other hand, the Yatman family pedigree, at least as far as it went a hundred years ago, is well known, so anything I publish is not exactly going to be news. Anyway, back to the original point, which was pedigrees for those mentioned so far — and yes, I realize I’ve now mentioned another one in this post. In fact, let’s start with him. William Hamilton Yatman (1819-1913) was the younger brother to John Augustus Yatman (1817-1894), about whom I will later have more to write. John Augustus (or J.A.Y. as he sometimes signed papers) and his wife Anna Victoria Blachley Turner (1837-1922) had seven children, the eldest of whom was Frances Mary Yatman (1860-1949). Frances (“Gran” to my father) married William Henry Statter (1857-1895), with whom she had three children. She married again after William’s death (a Turner, but no relation to Anna Victoria as far as I can tell) and had two more children. The youngest of her children by her first marriage was Gladys Annie Dinah Statter (1885-1980), affectionately known as “Nin” to those of us who knew her (she hated the name Gladys). So far this has been an entirely English family, but Gladys married a New Zealander, John Fraser (1894-1964), and emigrated back to his country with him. John and Gladys had six children (five who lived to adulthood), second eldest of whom was Robert William Campbell Fraser (1921-present day), my father. In an earlier post about names, I introduced Alexander Fraser (1802-?) and his wife Grace Campbell (1811-? ), residents of Perthshire, Scotland. Alexander and Grace had ten children, second eldest of whom was Robert Campbell Fraser (1838-1905), who emigrated to New Zealand for reasons not yet known to me. There he married a Kiwi girl, Sarah Ann Cliffe (1864-1936), and had eight children, four (or maybe five — I haven’t been able to track down what happened with one of the daughters) who lived to adulthood. Third eldest of those living that long was my grandfather, John Fraser, the one who married Gladys of the Statter/Yatman family. In The Voyage of the Adamant I introduced James Spratt (1844-1935) and his wife Maria Rawlinson (1844-1909), who emigrated from England to New Zealand. See Emigrants to connect from the Spratts to me through my mother’s line. * A History of Winscombe Hill and the Yatman Family, by Maria Forbes, published 2005, appears to be a very limited run. I have found exactly one copy for sale, used, and the seller is asking for more than $300. It might have to wait. I have a few tantalizing photocopied pages sent me by my uncle which I believe are from this book, and which show my great-grandmother Frances and great-grandfather William at the time of their marriage. I think the author wrote the book specifically for one modern descendant of the Yatmans, Sue Gunn, to whom it is dedicated, and who I believe may have been the last private owner of the family estate at Winscombe Hall. The Adamant sailed from England to the South Island of New Zealand in 1875, arriving at Bluff on December 4th after a voyage of 144 days. It was one of the more unusual voyages for an emigrant ship, as you’ll see from this diary recorded by one of the passengers. Among the passengers were the family of James and Maria Spratt, my ancestors. My thanks to Elaine Mullins for passing this account on to me. A short sketch of the voyage, with an account of the ship running aground. July 10th We left Blackwall at about 2pm, and arrived off Gravesend about 4pm. July 11th More Emigrants arrive on board. July 12th The Government Inspector arrives on board and passed all correct. We had a splendid view of the Gravesend Regatta. July 14th At 1pm the Tugboat came alongside and we were tugged as far as Peachey Head. July 16th The Pilot leaves the ship. We had a splendid run down the Channel. July 23rd A child died belonging to Mr Hill, was buried with usual shipboard ceremony. July 28th A Mrs Phelps was confined of a son. August 15th One of the crew caught a shark which was cooked and some of us had the pleasure of tasting it. August 21st Crossed the line, seven of the crew undergo the curious old custom of being shaved. August 28th Concerts have been going on greatly to the amusement of the passengers for sometime past and they were enjoying themselves in this way this evening. Singing had not long commenced when the look-out on the forecastle shouted “Light ahead“. Some of us went forward to look at it. The Captain, First Mate, Boatswain, with others of the crew soon joined us, and using their glasses, came to the conclusion that it was a ship’s light. However, it did not appear to make way for us, for we were making right on it. After a short time, the Captain gave orders to bear off to the right. We were not sailing for more than fifteen minutes, if as long, when suddenly a light much larger than the first burst upon us. “Why” said some, “That’s another ship just put out her lights.” To the experienced, it was only too evident that a lighthouse which had hitherto had the dark part of the lantern towards us now glared in all its brightness towards us. Then came the scene. “Clear the deck, all married women below. All hands about ship,” were the orders given from the Captain in rapid succession. That, with the knowledge that the lights were land lights and not ship’s, caused some to think we were running aground. Indeed, one woman ran below wringing her hands, called for her children, shouting “What shall we do, we are on the rocks?” The ship was soon about and all was quiet, except among the women below, where there was some excitement and one or two fainted. The lights were watched for more than half an hour after the ship went about. The Captain certainly did not know where we were for he said the name of the place was Pernanbuco. Next day we learned that we were between 3 & 4 South Latitude. Pernanbuco is about 9º South, so much for the Captain’s care. This was the last concert held on board. September 1st Sighted an island named Fernando Noronha after tacking about. In fact it has been all tacking about on the coast, for we have had the south-east trades against us. We sight land again on the 4th, 5th, and 8th September. Still in sight of land, and we passed two black men in a boat, fishing. September 9th Saw lights from shore at 8pm. September 10th At 8pm, the Captain ordered married women below. They refused to obey as it was too soon and a beautiful night; at 8.15 he again ordered them below and again he was disobeyed. At 8.40 the Boatswain was ordered by him to play the hose upon them. The Boatswain acted as though he did not hear. At 9 o’clock he ordered them below again. At 9.15 they went below. As they were descending the hatchway, the captain threatened them in the following language, viz ; “The first time it blows half a gale of wind I will pay you for your trouble.” He made use of words to the same effect when going his rounds with the Doctor at 10pm. September 11th The following notice was affixed to the door of the stores, viz, “All married females are expected to go to their beds not later than 9.30pm, if ordered below earlier it will be for the working of the ship, or on account of bad weather.” by order Thomas Burch, Master. 11th Sept. ’75 G J Stewart, Surgeon. September 13th Once or twice it seemed as if we were trying how near we could get to land without meeting danger; more than once the rumour went around that we were very near running aground. September 16th The novelty of seeing land was now worn off. It was in sight all that day and we were slowly making on it; about 4pm, as the ship was put about, there was so little water that she actually stirred mud from the bottom. In spite of this, the Captain again ordered her about at 7pm. At 8pm rockets were fired from shore. One of the women on seeing them, said to the Captain, “Look at the lights“, on which he ordered the married women below, and the mainsail up ready to go about, and there, unfortunately, he stopped. At 8.30pm I was speaking to the Engineer. He told me he had stopped the engine, for we should not require any more water, and that he had packed up his box of tools in readiness to go ashore, as he said we should soon go aground if the Captain continued on the same tack as we were then going, and that he should not go to bed before he had seen the ship put about. Being in such shallow water before on this tack, and so soon turning on it again, caused us to think we were getting in shallow water again. So they began sounding about 9.20pm. We were in nine and a half fathoms of water, at 9.50 the ship was put about. At 10.5 the ship struck on a coral reef, but as the wind was very light, we did not go on with much force. I got up from bed and dressed myself, and when ascending the hatchway, I saw the Doctor, and he asked me what I wanted. Before I could reply to him, he told me to go below and pacify the women. I went below to please him. There was some little excitement among them. It was no easy matter to pacify them. I then went on deck again, looked over the side, and found, as I had anticipated, that we were stuck fast. We must be thankful that it was a beautiful moonlight night and very little wind. All the sails we set, including the Royals. Orders were given to square the yards to back her off. This was done several times, but finding they could not back her off in this way, word was given for all men to muster on the poop. They were desired to run from side to side. This had the effect of lifting the forepart of the keel, where she was caught, and the wind filling the sails from forward, they being square, drove her back, and we so got free, but only to get aground once more. The same means were again applied, and she was got off the second time. So we sailed away quite safe about 12pm. The whole time, the Doctor, 1st Mate, and 3rd mate acted manfully, the former in pacifying the women, the two latter in doing their utmost in getting the ship off. The Captain, through whose intemperate habits we got aground, was holding himself on to the rails insensible through drink. The passengers did not care to go to their beds again, but gathered in groups expressing their indignation at the Captain’s conduct, and they determined to send in a requisition for the Captain to resign his post to the 1st Mate, owing to the former’s intemperate habits, also to put into the nearest port to have the ship examined. The passengers accordingly went on the poop to the 1st Mate and asked him if they were to send in a paper requesting the Captain to resign his post, would he take charge of the ship in his own hands. He gave them no definite answer, but requested them to go below, and assured them that he would answer for the safety of the ship for the future. Going aground by no means came to us by surprise, for every thoughtful mind could see, by the way in which we were hugging so dangerous a coast, that it was next to impossible to escape some danger, more particularly when we consider that it was rumoured on good authority that the chart for the West Coast of South America was lost, and they were obliged to work on one that had become obsolete, and it was not for some time after we left the coast that the right chart was found. Please to mind your own business and leave navigation to myself. We very much felt the need of some provisions in the law. Here was the Captain in command of a ship with about 250 souls on board. His intemperance unfitted him for his post.. He would not allow the 1st Mate to exercise his judgement, but insisted on commanding himself. We saw our danger, but to act determinedly would be mutiny. We ask him to put in at the nearest port, he coolly refuses. Would it be any use suggesting to the authorities that there be no strong drink except that used for medical comforts on board an Emigrant ship? September 18th We get a breeze from land which takes us out to sea. September 21st Sight land at daylight. September 26th The wheel was lashed. September 28th A Mrs Hart was confined of twins. October 10th Very rough, ship a heavy sea, which came between decks. October 12th A Mrs Phillips confined of a son. October 13th Passed the Cape of Good Hope. October 17th A Mrs Ayling confined of a daughter. October 21st Sight Prince Edwards Island, the top of which is covered with snow. October 24th At 4am, Mrs Ayling died, was buried at 1pm. Saw an iceberg. October 27th Saw two more icebergs. November 3rd A cask containing some rum was thrown overboard by the Chief Officer’s direction. November 4th Money left in the care of the Captain by passengers was returned to passengers by Chief Officer. November 6th At 5.40pm, the Captain died. November 7th The Captain was buried at 12 o’clock noon. The unfortunate gentleman was never seen on deck but twice since the ship ran aground. November 17th Mrs Hill confined of a daughter which only lived a short time. November 22nd Had cable up anchors, served out with the last of preserved meat, only had sufficient for the children. November 23rd The last of the pork is served out. November 24th Have porridge made for breakfast and served out with boiled rice for dinner in place of preserved meat. November 25th Store day. Each mess are served out with about 1lb of butter, no raisins. The single men receive no butter or tea. November 27th Pearl barley is issued in place of arrowroot or sago for children, and sugar in place of treacle. November 28th Sight a vessel Homeward bound from Melbourne. By orders of the Chief Officer, the lifeboat on the weather side is lowered and the 2nd and 3rd mates, accompanied by four of the crew rowed across to her, and returned with a small cask of flour, which fell overboard while hauling the boat up. After a short time, the boat on the lee side is lowered, and they succeeded in getting the cask again which they managed to get on board this time. We had a very pleasant voyage. The food was very good with the exceptions of the potatoes and bread. The potatoes at the beginning of the voyage were so bad that at the rate of only one or two issued for a mess could be eaten. The bread was very bad for nearly all the way out, owing to having such bad flour for consumption. It was so bad at times that several batches were obliged at times to be thrown overboard. The oatmeal and rice were issued in a cooked state for about a week before arrival only. We were fifty-one days in the tropics, and saw several kinds of fishes, amongst them may be mentioned whales. We the undersigned emigrants on board the ship “Adamant”, do earnestly request that the Captain give up the authority he now holds on board the above mentioned ship, to the 1st Mate before proceeding any further on our journey, as we consider our lives in peril through the ship being run aground about 10 o’clock pm, September 16th 1875. And likewise through the intemperate habits of the Captain, Thomas Burch. And if the Captain refuses to act in accordance with this requisition, we desire to be put in at the nearest port.